TOPO! interactive mapping software enables you to create your own seamless, customized topographic maps. Easy-to-use tools allow you to draw routes, calculate elevation profiles, add your own notes to the maps, and more. 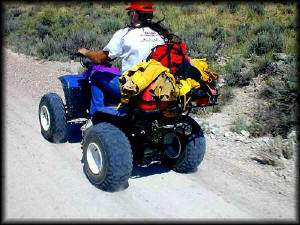 Off Highway Vehicle Education program. 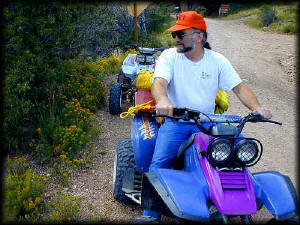 USA-ALL is composed of folks who are interested in equal access and recreation on public lands. 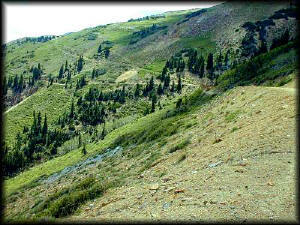 This trail is like most in the High Country around Marysvale; it led to many, many more trails! Quite a few of the trails are forest service/fire break roads. It was on a trail like this I came across an older Ford fullsize pickup with a retired couple (he looked like he was in his seventies) just moseying along in first gear. I stopped and talked to both for a bit, and found out they lived in Beaver (about 20 miles away on the West side of the Tushar Mountains where this is). They both liked to come into the mountains for lunch. I must have looked puzzled before one of them spoke up, "We like to picnic in the mountains." Wow! I hope I'm able to do such things when I'm at that age! I bid them good day and continued on. This is my Dad. 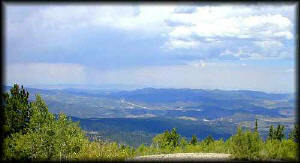 He joined me for a day, and we rode to the shale mountain ridge near Mt. Belknap. He wouldn't ride to the top though, as it was kind of scary. (Hey Dad, I still think you were chicken! Bwuck! Bwuck!) I'd already gone up several times though, so my wariness was diminished. We spent a day riding around the area toether, and went as far as Kimberly, the decayed ghost town. Yeah, it's fair to say he had a good time. He is a cross-country truck driver, and I'd seen him only once in several years. I was very pleased to have him come by, but sad that he could only spend a day with me. We are hoping to get together again in 2002 and explore more of this beautiful land. I snapped a pic as we were riding. The rack on the rear is just an aftermarket rack that, in five minutes, bolts onto the existing wheelie-bar on the Warrior. I had room for everything I wanted to take, even the extra gas I never needed. This is a view looking north from Winkler Point, which is on the trail to Kimberly which lies below the edge and to the left. You can make out I-70 in the distance, running towards I-15 25 miles to the west of us. One of the many mines. 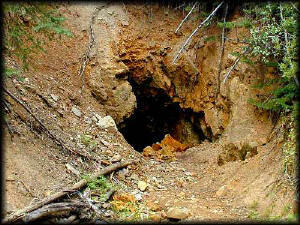 This one was on the trail to Kimberly, and was the location a great walking tour of an old mining site. Small paper maps were available from a visitors box, and you could take tour of the mine (not in it, but around it) and the surrounding area. It talked about life in the late 1800's for the people that lived here, and was very informative. Another impressive work by the State of Utah. 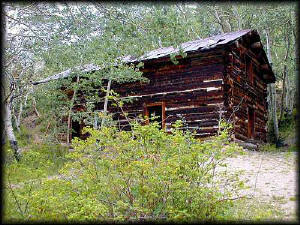 This is the cabin near the mine that is part of the walking tour. It is a two story cabin, quite large for its day, which was necessary since the miner, his wife, and many kids lived in the bottom floor. Upstairs lived up to a dozen miners all in his employee! The inside was intact, and I even went upstairs to the second floor. Due to the creakiness I dared not venture away from the walls upstairs. I found it hard to believe some 20 people had lived in the structure. It seemed like it must have been quite an operation; there was even a blacksmith building on the premises. 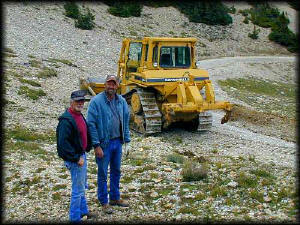 I met these two guys clearing the forest service road between Beaver and Marysvale. Not pictured is a road grader which followed the dozer and smoothed the road out quite nicely. I stopped and talked to the taller genteman, Mark Cannon, for some time. He was very pleasant and told me that he was a rancher who also worked for the County driving heavy equipment. Apparently, while ranching is a good way of life, it isn't something that will make one rich. Like most ranchers, he works a second job to support the first. Yep, it was full of mud, as I found from a quick cruise around it's shore. Unlike most lakes and streams around, I would be hard pressed to believe there are any fish in it's murky waters. 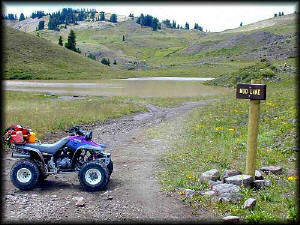 This is a trail between Kimberly and Marysvale. I'm standing on the upper bank looking down. Does this give you any idea how steep some of these mountains are? Mark, the guy driving the dozer above, told me of a UHP officer that was riding a quad in the hills near here, lost control, and went over the edge. He lived, but was in a world of hurt. I can see why. It's a long way down. On another narrow trail not far from here I was exploring near a steep canyon, and the trail forked. I went one way and immediately found the end of the trail - literally a few feet away from going over the edge. The only way out (other than head first a few hundred feet to the bottom) was to back up and turn around. What I thought was a fork was where everybody had been turning around once they discovered it was a dead end. Had I been ripping along or not paying attention, I would have also been in a world of hurt. 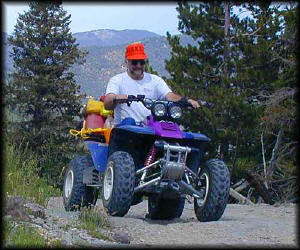 NEW "Paiute ATV Trail Guide Book". 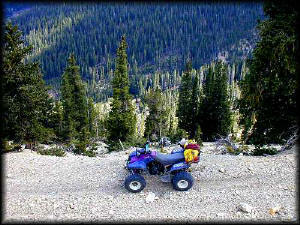 Page after page of detailed information on the Paiute ATV Trails. Photos, Maps, GPS Data for every intersection and point of interest on the trail, Tip and Tricks for riding the Paiute ATV Trails. Trails Illustrated topographic maps are designed to take you into the wilderness and back. Printed on durable tear-resistant, waterproof material, this map can go virtually anywhere you do! Send mail to our webmaster with questions or comments about this web site.